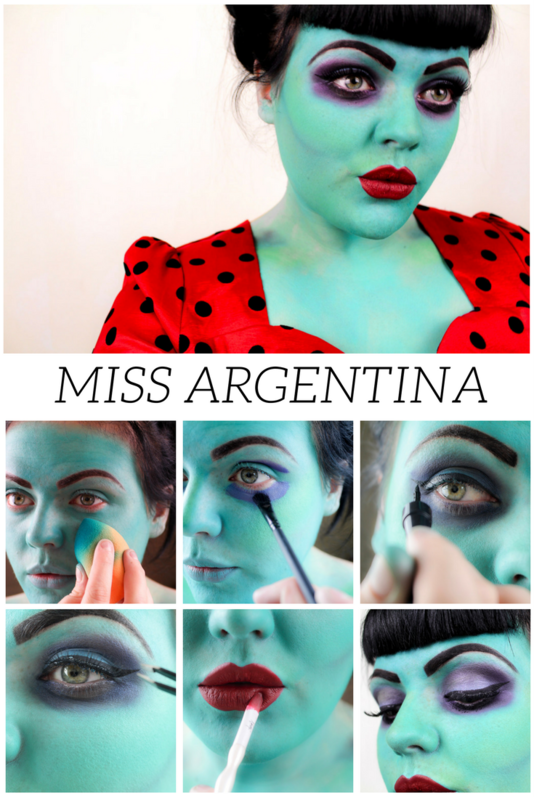 For those who aren't familiar with the film Beetlejuice, this look is based on Miss Argentina aka the receptionist of the Netherworld/Afterlife. I've wanted to recreate this for a while now so here it is. 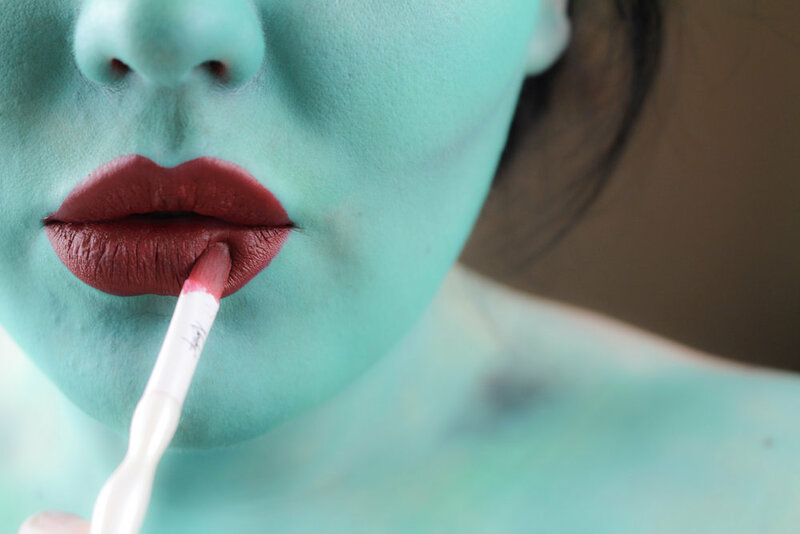 Perfect for Halloween, and add some scars or blood and it can easily be turned into a zombie or Frankenstein-esque look. It's time to make yourself green with envy, or more like your body is decomposing! 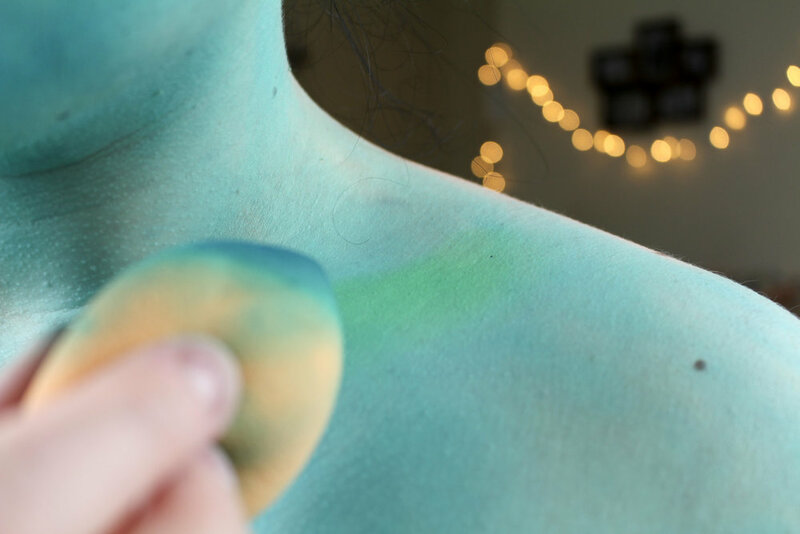 I love Snazaroo face and body makeup because it's easy to apply, water-based and doesn't irritate my skin. 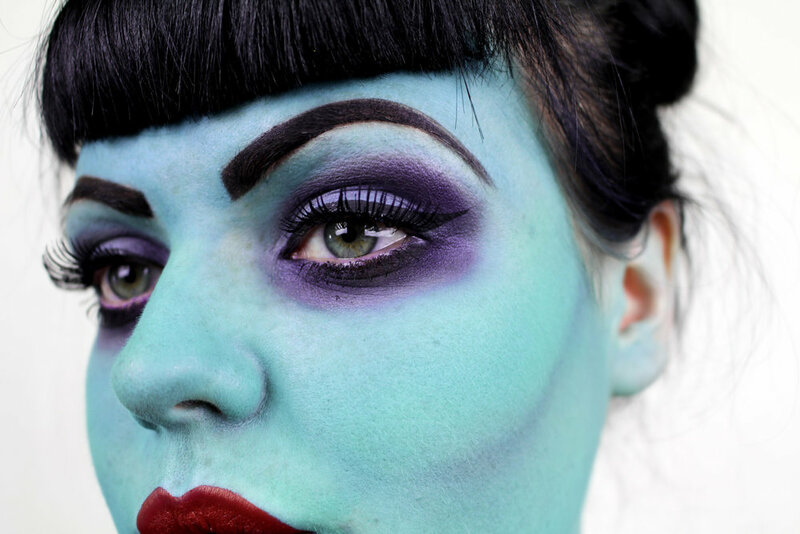 For this look I've gone for their Sea Blue colour and applied it all over my face, neck and shoulders. If I was wearing this look out I would probably paint my whole arms too. I then contoured my face and collar bones to look even more dead. Although I feel like if Miss Argentina was alive (or in the afterlife) today her contour would be on point. 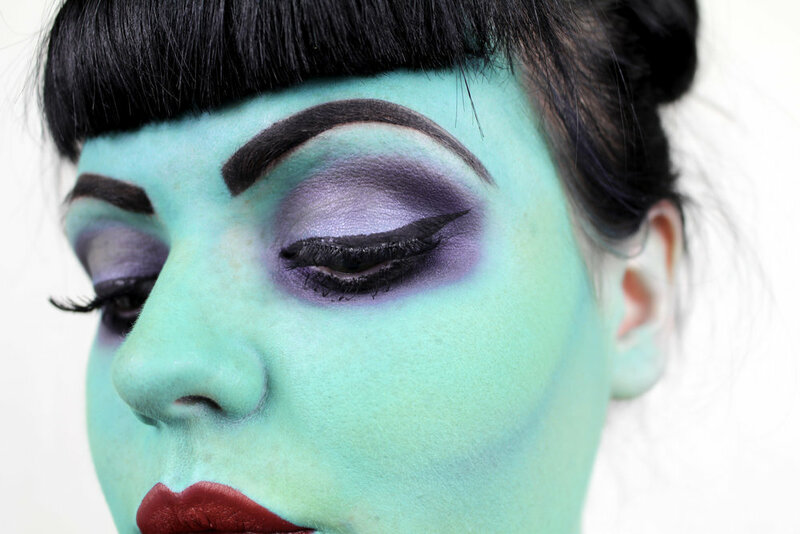 I used a dark blue shadow to contour and added bright green face paint as a highlight. To create Miss Argentinas sunken-in yet glamorous beauty queen eyes I applied a mix of dark blue and purple eye shadows underneath the eye and in the crease. I didn't use much technique for this but just kept blending the colours out until I was happy. 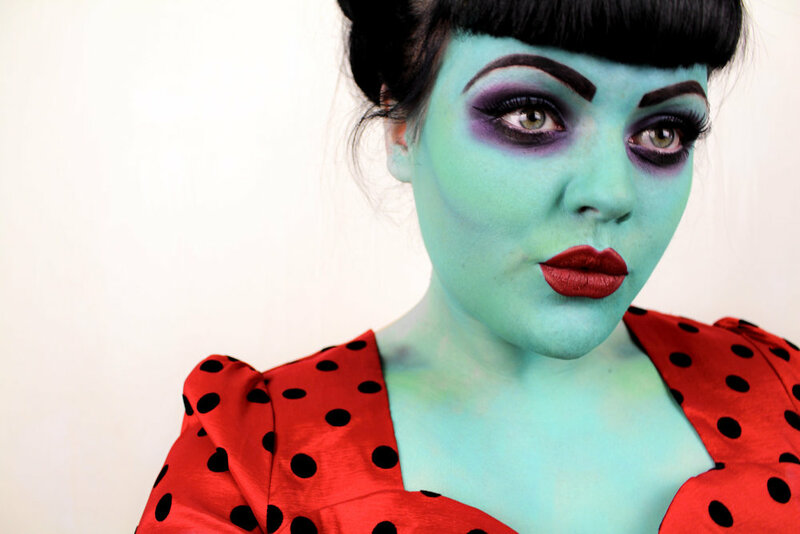 I used a range of colours from the Urban Decay Gwen Stefani palette and a Beauty UK palette. I then added black onto the bottom lid to make them look even more dead. At this point I felt as if I'd just been spat of of a Suicide Squad promotional poster. It was time to add some eyeliner to turn yourself into the winning beauty that Miss Argentina is, or was until her 'little accident'. If you want to know exactly how to do a wing like this click here. I also darkened up my brows. I just went over with a black shadow over my 'usual' eyebrow look. The look wouldn't be complete without some fabulous lashes. I'm just using some natural Eyelure ones that I had on hand, but I think it would be even cooler with some HUGE ones. Whilst these were drying I applied Miss Argentina's red pout. I used my favourite red lipstick, MAC's Russian Red. I then went back in and applied some mascara.